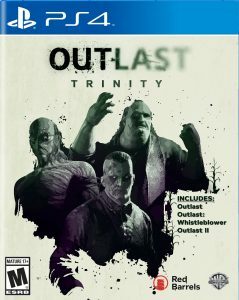 Both Outlast 1 and 2 feature the same style of gameplay with a few added things in 2, you play in the first person view as reporter’s Miles in Outlast 1 investigating an incident that took place at an insane asylum coming to discover experiments have been conducted on their patients. The patients of the asylum have become very psychotic and are looking to kill you before you escape the asylum. In Outlast 2 you play as Blake who is on an assignment investigating an 8-month pregnant woman as you approach your location their helicopter crashes. You wake up in the dessert in Arizona finding the pilot skinned alive and Lynn has been taken by a cult because they believe that she is pregnant with the antichrist and you are the father; so you want to get out of the Supai region and get Lynn. During Blakes horrible nightmare he keeps getting flashbacks to the school he went to as a kid revealing how his friend Jessica died in that school. Like I said previously these two games have the same gameplay style, you are running around two creepy locations with your only way to see is a camera light and the natural and rare occurrences where there is a light. In order to keep using the camera lights, you need to collect batteries or else the light goes out. You will have run in with enemies but there are locations you must hide so they do not catch you or else you will die a horrible gruesome death. The only difference in gameplay is in number 2 you have a microphone on your camera that can track sound, and you record some things to collect evidence which is really annoying because you do not need collectibles in these type of games it is really tedious. Outlast 1 and 2 are both very good at bringing the psychological horror to life with no weapons, just a camera to keep you alive is a very thrilling and terrifying experience all at the same time. Making it better than Resident Evil Biohazard which was released earlier this year.